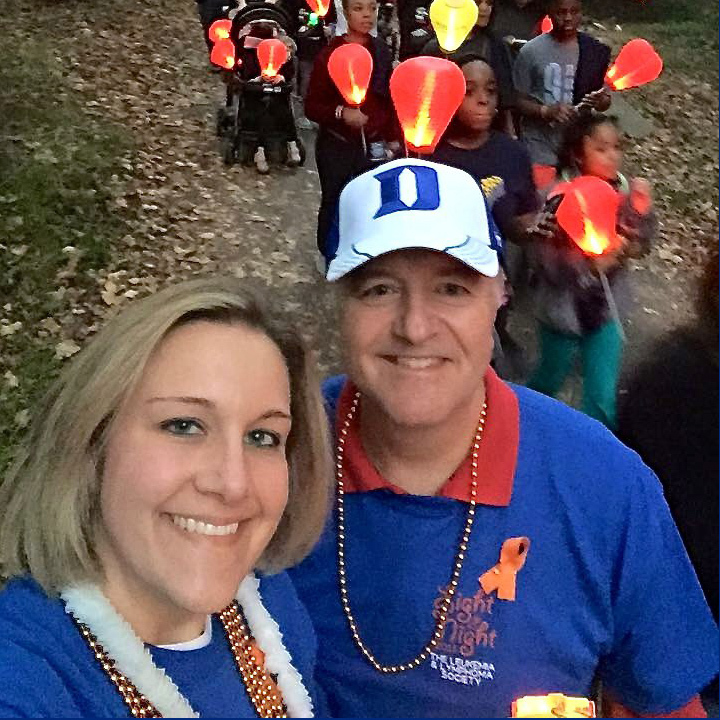 Radiation oncology nurse Nicole Kenney, BSN, RN, OCN, CNIII, and Team Noreen are raising funds for The Leukemia and Lymphoma Society’s annual Light The Night Walk in October. Kenny has been stepping out for the walk since 2010 when her mother, Noreen, was diagnosed with acute myeloid leukemia (AML). Acute myeloid leukemia, a type of cancer in which the bone marrow makes abnormal myeloblasts (types of white blood cells), eventually claimed Noreen's life, but since that time Kenney has fallen headlong into the fight to help fund a cure. Kenney has partnered with Lauren Ling, a friend and graphic designer who lives in Nashville, Tennessee. Ling, who owns Pine Designs Tennessee, designs a new graphic each year for Kenny's tee. Ling volunteers her time and talent, supporting her friend's desire to promote the cause. This year, Kenney is offering two designs. Proceeds from the sales of the tees are credited to Team Noreen and benefit The Leukemia and Lymphoma Society. The Wine and Design benefit event will take place on Saturday, Sept. 16, at Wine and Design Durham, 4810 Hope Valley Road, STE 109, in Durham, North Carolina. Guests are encouraged to bring their own beverages and snacks. There is a $45 registration fee. To register, visit Wine and Design. 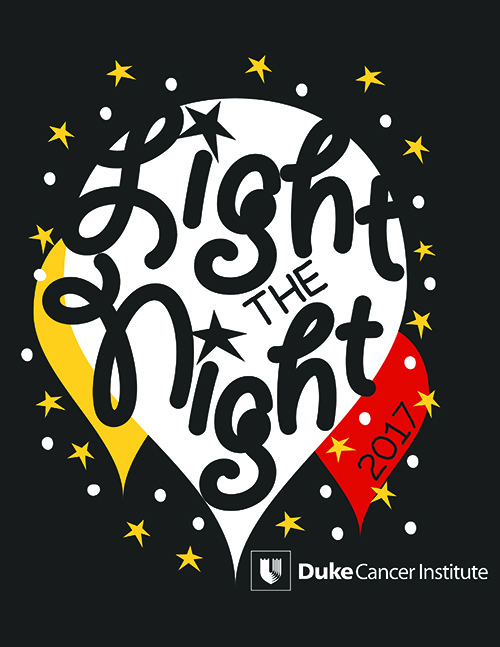 North Pavilion: Tuesday, Aug. 8, from 9 a.m. to 1 p.m.
Duke Cancer Center (Durham): Tuesday, Aug. 15, from 9 a.m. to 1 p.m.
Duke Cancer Center Raleigh: Tuesday, Aug. 22, from 10 a.m. to 1 p.m.
Duke Women's Cancer Care Raleigh: Tuesday, Sept. 5, from 10 a.m. to 1 p.m.
Duke Cancer Center Raleigh: Tuesday, Sept. 12, from 10 a.m. to 1 p.m.
Duke Cancer Center (Durham): Thursday, Spet. 14, from 10 a.m. to 1 p.m. When ordering, please specify quantity, size, long- or short-sleeve and design preference. "I am psyched for this year's walk," Kenney said. "My Dad will be coming from New Hampshire to participate. My Mom would be pleased to know that her battle is being honored, even after all these years." The Leukemia and Lymphoma society currently fund more than $1.2 million in research grants at Duke. 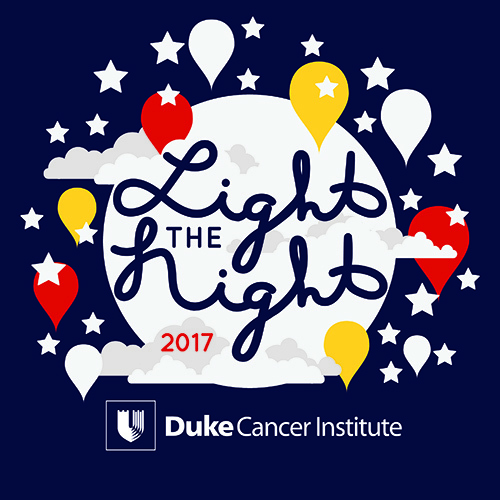 The 2017 Light the Night Triangle Walk will take place at Booth Amphitheatre in Cary on Saturday, Oct. 28. Faculty, staff, patients and caregivers are cordially invited to join Team Noreen, captained by Nicole Kenney; Team Duke Cancer Institute, captained by Danielle Brander, MD; or Team Duke Cancer Center Raleigh, captained by David Zaas, MD, and Aimee Zaas, MD.